Lets roll up the sleeves and prepare this amazing rustic soup. Yummy! Chop the onions and red pepper into small chunks (the smaller the better) and add them to your cooking pan together with olive oil. 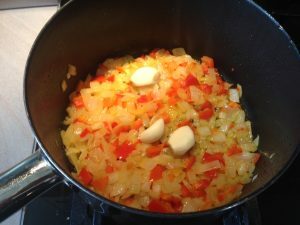 Saute the veggies and once the onion gets soft add whole garlic cloves. Stir and continue to saute over low heat. 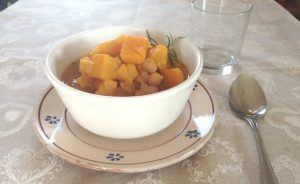 Chop the pumpkin (I like butternut) into cubes and add it to the pan together with drained chickpeas. 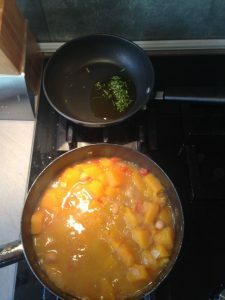 Mix gently all together and let it simmer for about a minute. Add boiling vegetable broth to to mix and stir. 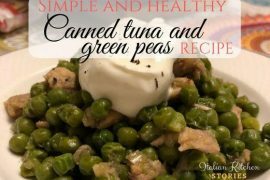 You can use my recipe to make broth in advance or you can make it while preparing your soup. Cook with lid for about 20 minutes over low heat stirring occasionally. 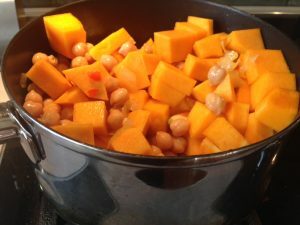 If you are using harder types of pumpkin (butternut is very delicate and it gets mushy easily, so I skip this step) you will take about 1/3 of your soup with pumpkin and chickpeas and squash them into smooth cream with your hand mixer and them add it back to the pot. 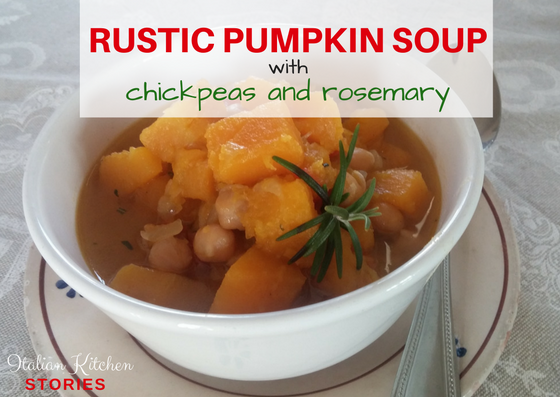 To finish up your rustic pumpkin soup with chickpeas and rosemary you will chop finely fresh rosemary leaves and add them to olive oil. Heat it up slowly so that oil absorbs all the essence of rosemary. Divide your soup into bowls and add rosemary oil to each of them. Decorate with fresh rosemary branch and serve with some toasted buttered bread.